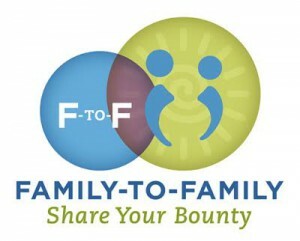 I’m so happy to welcome Shauna Niequist to DALS’s guest series on family rituals. 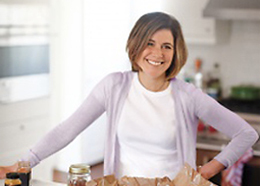 You most likely know Shauna from her blog and bestselling books about food, family and faith. 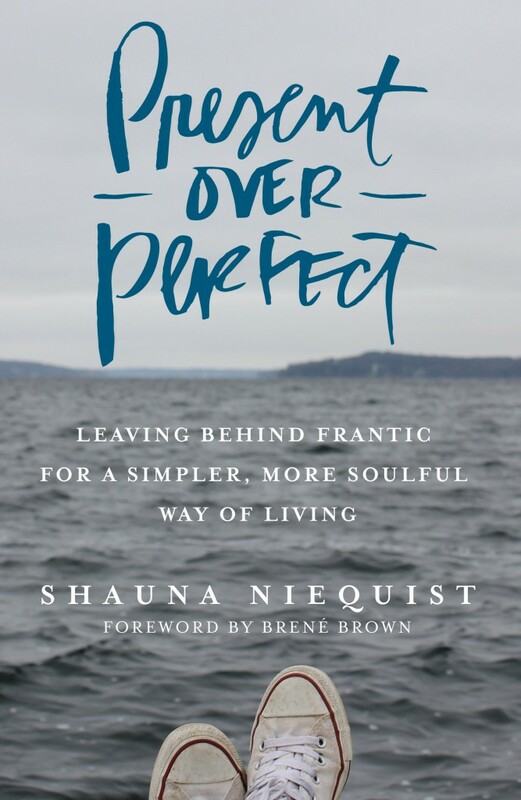 Her latest, Present Over Perfect, is a poetic manifesto about slowing down, saying no, choosing messiness over perfection and, as she writes, “turning her life around from the inside out” to make time for what matters. (I’m guessing a few of you out there might relate?) 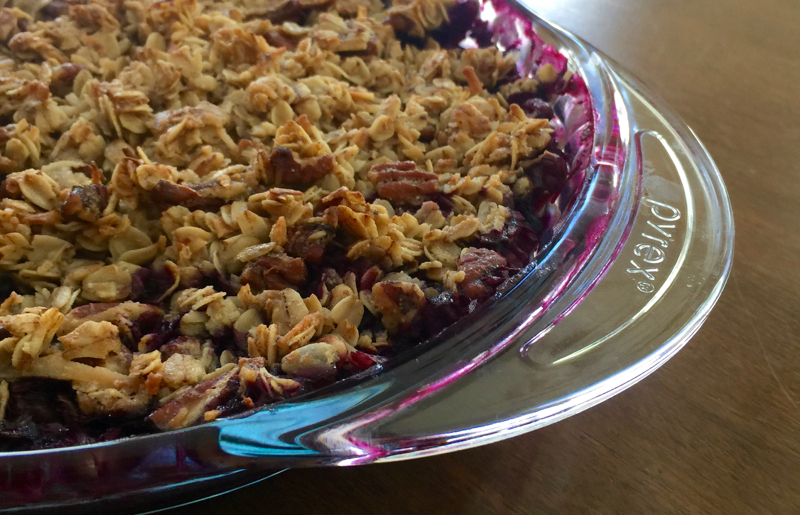 Here, she writes about a beloved family recipe: Blueberry Crisp. It’s a good one. Take it away, Shauna! All my life, we’ve been spending summers in South Haven, Michigan, a small lakeshore town on Lake Michigan. My parents had their first date in this town. My grandfathers both kept sailboats in the South Haven city marina. Our boys, almost five and almost ten, both learned to walk and swim in this town. Our love for this little town runs very, very deep. This is the place where we recalibrate, reconnect, look back at the year we’ve just lived, contemplate the year ahead. It’s where we spend as many hours a day as possible on the beach, the boat, the porch. It’s where we wear swimsuits and flip-flops for every occasion, where swimming in the lake counts as a shower, and where ice cream is a perfectly acceptable dinner. Fun fact about South Haven: It’s known for its blueberries—there’s a Blueberry Festival, a Blueberry Queen, even a Blueberry Store, where you can get blueberry soap, blueberry candles, blueberry everything. I grew up picking blueberries with my grandma and my cousins, eating them by the fistful out of our buckets when grandma wasn’t looking. And now on cloudy days, instead of going to the beach, my boys and I head to the blueberry farm. We freeze berries bag by bag all summer long, and when we move back to Chicago at the end of the summer, I couldn’t care less if we remember to pack the bikes or our clothes, but do we have the berries? Did we remember to take the berries? We pick and freeze strawberries, cherries, and peaches, too, but really: the blueberry is the star here. My mom kept a space freezer of blueberries when I was growing up, and all year round, on Sunday nights, she made us blueberry crisp. And now I make it absolutely all the time—when friends are coming for last-minute dessert, when I want to serve something sweet but not too sweet with an afternoon coffee, or when I’m making a big breakfast for houseguests. There is literally nothing I’ve made more in my life than this crisp. The split second after we decide to invite friends—or, even more fun, when we hear that someone’s dropping by, I begin the very familiar movements: start the oven preheating to 350, pull a baker from the deep cabinet next to the stove. Grab a bag of berries from the freezer, maple syrup from the door of the refrigerator, open the pantry for nuts, almond meal, circle back to the green-glassed olive oil on the counter. I can make it in about 90 seconds without measuring—sometimes I just use a juice glass—a whole glass of oats, a half of nuts, a half of almond meal. A quarter of maple, another quarter of oil. There is, on most days, at least half a crisp covered with foil, sitting on our stove, waiting to be dipped into with a spoon in the middle of the afternoon. This is my recipe, updated from hers—it’s gluten free and vegan, and with a scoop of Greek yogurt, I think it’s the perfect breakfast. My original recipe, from Bread & Wine, calls for olive oil, because basically you always have it, even if you’re out of almost everything else. But lately I’ve been making it with coconut oil, and adding in some unsweetened coconut flakes in place of some of the almond meal. You can use almost any fruit—I love a combination of black cherries and blueberries, or peaches and blueberries. And you can absolutely use frozen fruit—just make sure to bake it for a little longer. And I like pecans, but you can use walnuts if you like them better. You can use butter in the place of oil and brown sugar in place of maple syrup—a much more traditional crisp. I’m sure what you’re sensing is that basically, you can adjust or change this recipe in almost any way, and it is still easy and delicious. Pour the berries into a baking dish—I like our red Le Creuset ceramic baker best, but there are any number of good options, and if everything’s dirty, I’ll make it in a 10-inch cast iron skillet. In a separate bowl, mix the remaining ingredients with a fork, and then pour it over the berries. Bake at 350°F for 30-40 minutes, or until just a little brown. If you’re waiting for a deep rich brown, you’ll be waiting forever, so just pull it out when the fruit is bubbling and there’s a little golden color on the crisp. Thank you Shauna! Present Over Perfect will be published this week, and is available on Amazon, Barnes & Noble, Indiebound, and everywhere books are sold. Hooray for South Haven — it is my happy place too, Shauna — and a freezer full of its blueberries to be eaten all year! And I have a fridge full of blueberries right now, part of which is going into this crisp. This post warms my heart. I think we all have places that are special to us like that. It’s wonderful that you’re so connected to South Haven and are able to keep that connection going for a bit longer with those frozen berries. I’m sure that crisp tastes amazing! I’m looking for some new dishes for my breakfast. 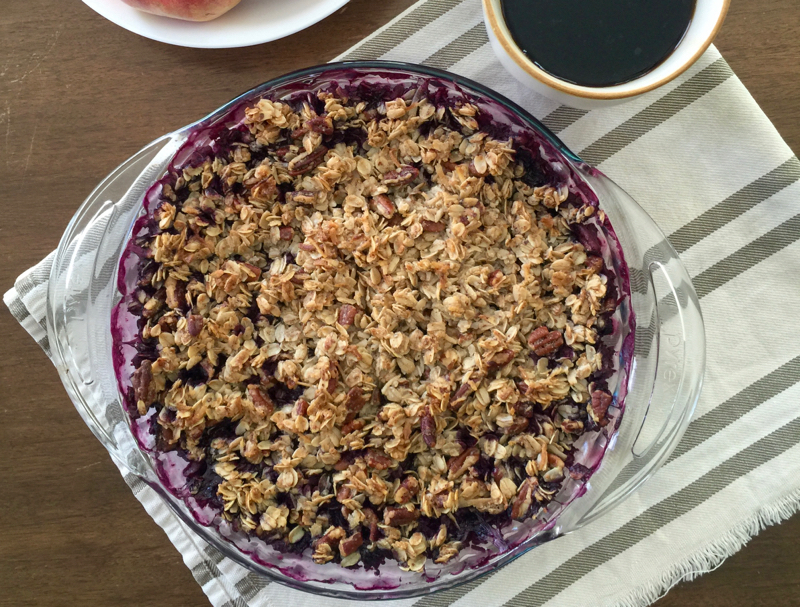 And Blueberry Crisp is looking so delicious and healthy. Will try to make it soon. It sounds amazing but I never understand how people pull off moving to a lake town or beach house for the summer. Don’t they have jobs? It’s a mystery to me. 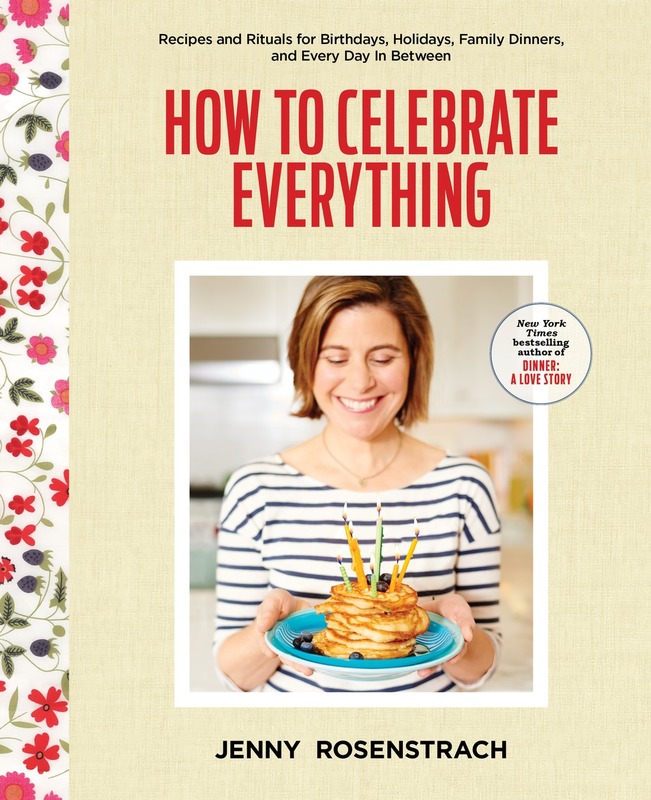 I sure hope that the new book includes rituals for people who are not independently wealthy and who work in boring old office jobs. haha. There are not a ton of perks in the writing world (I speak from experience) but one of them is definitely having control over your own schedule. (In Shauna’s book, you’ll see that even this can be a mixed blessing.) But yes, to answer your question, lots of everyday rituals in my book that do not require a freelance career (or a trust fund). I made this over the weekend and it is Awesome! Thanks for sharing. My Grandma does the same thing – apple crumble is her “go to” dessert. She leaves zip lock bags of the buttery, cinnamon crumble topping in the freezer to throw on some quickly cooked apples if she has unexpected guests. The resulting smell that fills the house is absolutely amazing! Thanks to you and Shauna for this recipe! I have made it three times in the past week. It’s totally delicious and endlessly flexible to meet my friend’s dietary restrictions. I am practicing presence over perfectionism every day. I fail greatly but I keep practicing. This looks great. Can you use regular flour or corn meal instead of almond meal? Thanks!